Hello nannies! My husband and I have two young boys, two and 11 months, whom we are looking for a loving nanny to take care of them when I return to work. Our boys are very active and love to have fun - so we are seeking someone who will play, entertain, educate and be involved. They love trips to the park, sports, reading books, fun art activities and music. I would love to have someone who is willing to do light housekeeping; meal prep on occasion and run errands within the neighborhood (for example: groceries). 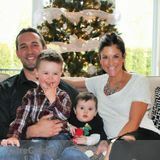 We are such a fun loving family and we hope to connect with the most perfect nanny for our boys! They are so loveable, we know you will just love them.